Recently Local Studies received a donation of the minute book of the Drummoyne District Tennis Club covering the years 1933 to 1965. The minute book provides a glimpse into the social life of the times. Besides tennis, the club had an active social committee which organised card nights at the homes of members, evenings at the ‘pictures’ and dances at the ‘Cairo’ (a dance hall on Victoria Road, Drummoyne). A Chairman of the club, Ronald Thomas Clyde Storey, was later Mayor of Drummoyne. The Drummoyne District Tennis Club’s courts were on the corner of Gipps and Polding Streets which the club rented. In 1965 the lease ended and the club ceased when it was unable to find a new location. A block of flats has since been built on the site. 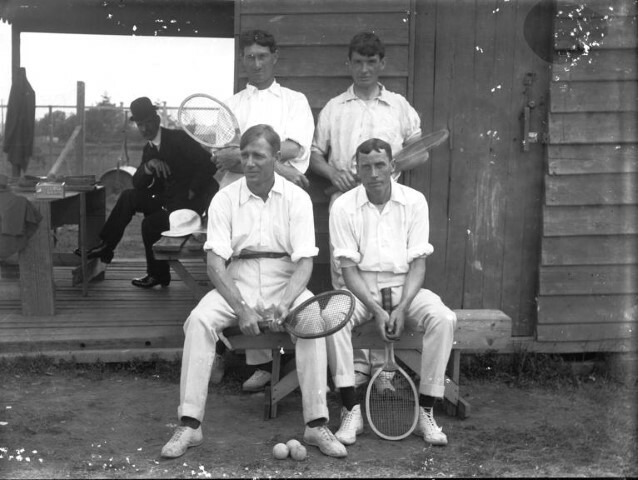 The photograph, above, is of an earlier Drummoyne Tennis Club taken in about 1910 by local photographer, Bessie Selfe. Surprisingly, from the midst of the horrors of the First World War came one of the prettiest of souvenirs. Embroidered silk postcards were first made at the time of the Paris Exhibition in 1900 and became a popular souvenir between 1914 and 1918. The postcards were produced in France by French and Belgian women. Panels were hand-embroidered by women and girls at home then sent to factories where they were cut and mounted on to card. The cards provided income for women and were a popular souvenir for soldiers to send home. 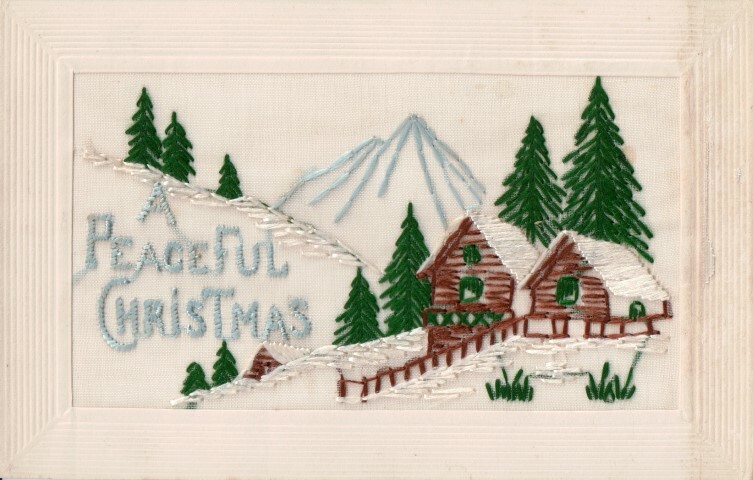 An estimated ten million embroidered postcards were made during the war. Generally the postcards were sent through military mail pouches so many of these fragile cards have survived in good condition. Their beauty and link with loved ones ensured that they were treasured by those receiving them. The postcard, above, was sent from France by Alfred Robert Cassidy to his Aunt Margaret Jeffery in Five Dock in 1916. The sentiments of the card still remain true today. 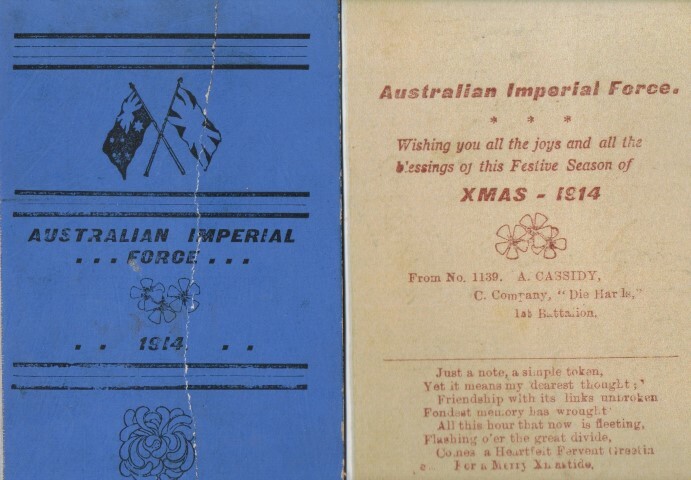 A Christmas card sent from Alf to his Auntie Maggie, ‘En route to England for the European War’ in December 1914. A common belief at the time was that the war would be ‘over by Christmas’ but, of course, it was to grind on relentlessly until an Armistice was declared on 11 November 1918. Alfred Robert Cassidy (‘Alf’) served with the 1st Australian Infantry Battalion and was killed in action on 9 April 1917 in France, aged 24 years. The little Christmas card, measuring 12cm by 8cm, was lovingly preserved by his aunt Margaret Jeffery (‘Maggie’) of Five Dock and was amongst material donated to Local Studies recently. In the late nineteenth and early twentieth centuries there were many tidal swimming pools along the Parramatta River providing welcome relief and recreation on hot days. Ashton’s Mortlake Baths, established in 1886, were the first enclosed public baths along the Parramatta River. The baths were hand hewn out of sandstone bedrock adjacent to the foreshore of Majors Bay at Mortlake. They were constructed and operated by Samuel Ashton, a bricklayer by trade, who emigrated from England. He and his family lived on the same site. In the early days males and females were strictly segregated. Under no circumstances were men and women allowed to swim together. Although electrical pumps had been installed so the baths were not dependant on the tides, competition from larger and more modern swimming pools in the area led to a decline in patronage in the 1930s. 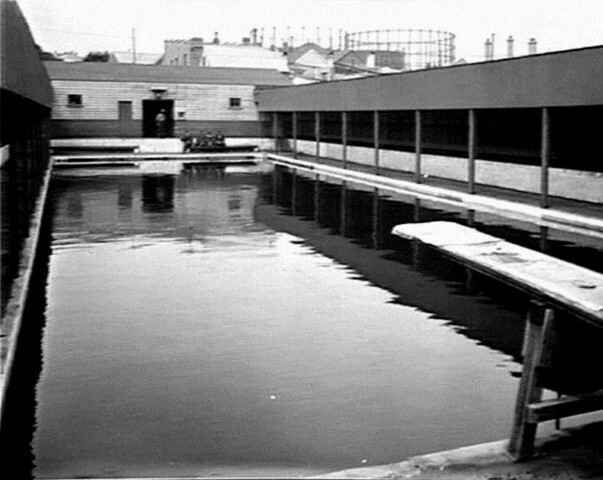 Ashton’s Mortlake Baths closed to the public in 1937 and were eventually filled in 15 years later.